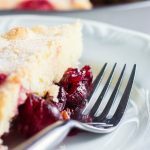 This easy, quick recipe for delicious Nantucket Cranberry Pie is a delightful alternative to traditional sweet desserts with its tart, bright flavors! Generously butter a cake pan. Add cranberries to the bottom of the pan. Sprinkle the chopped pecans on top of the cranberries, followed by 2/3 cup sugar. In a mixing bowl, combine flour, 1 cup sugar, melted butter, egg, almond extract, and salt. Stir gently until just combined. Pour batter slowly over the top of the pecans in large ribbons so that you can cover the entire surface of the cake pan. Spread gently if needed. Bake for 45-50 minutes. 5 minutes before removing, sprinkle the top of the pie with 1 tablespoon of sugar. Cut into pie slices and serve with ice cream or whipped cream or both!